These powders can be extremely expensive, and it is imperative any excess powder left after production is reclaimed for reuse. Due to the physical changes that can occur to unused powder during production, it cannot simply be reused. Deteriorated and oversize particles would compromise the quality of the next build. Considering the sectors where metal powders can be used in production, such as construction, medical, automotive and aerospace, the quality and reliability of the final product cannot be compromised. Sieving pre-production as well as reclaiming metal powders after manufacture ensures contamination such as large particles and agglomerations are removed, providing accurate and consistent particle size. To achieve this, a combination of a high-performance industrial sieve with an ultrasonic mesh deblinding system is required. 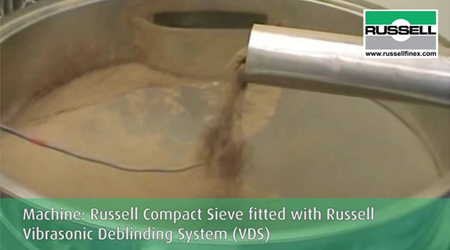 In this demonstration video, fine metal powders are screened using a combination of the Russell Compact Sieve® and the Vibrasonic® Deblinding System. Sieving metal powders is challenging as the fine particles tend to blind the mesh, reducing flow rates and causing loss of good product. Frequent pausing for cleaning and maintenance causes downtime and significantly reduces mesh life. The high-performance Russell Compact Sieve® offers increased screening capacity without requiring excessive headroom, and can fit easily into existing production lines. Minimal contact parts and a tool-free assembly ensure downtime is reduced as the metal powder screener can easily be stripped down and cleaned. Adding the Vibrasonic® Deblinding System allows for accurate screening of metal powders down to 20 microns. An ultrasonic frequency is applied to the mesh, preventing the mesh aperture from blinding and blocking. This enables the metal powders to be screened reliably and consistently, whilst screening equipment is kept running at its optimum. Russell Finex has more than 80 years of experience in processing complex metal powders. With a head office in the U.K. and subsidiaries in Belgium, the U.S.A, India and China, the company has a truly global presence. Ultimately, as metal powder production continues to develop, and manufacturers continue to expand their production around the world globe, Russell Finex has the infrastructure to support the industry anywhere on the planet. Contact a sales engineer today for more information.